Today’s edition of Sam’s Scores is ALL about Nintendo! If you thought I was only going to make a special Sega edition, you were wrong! Maybe an Atari one next?… With this edition comes another slight change to the layout, I think I’m finally getting it in order! As almost always, number eight was found at a local thrift store. 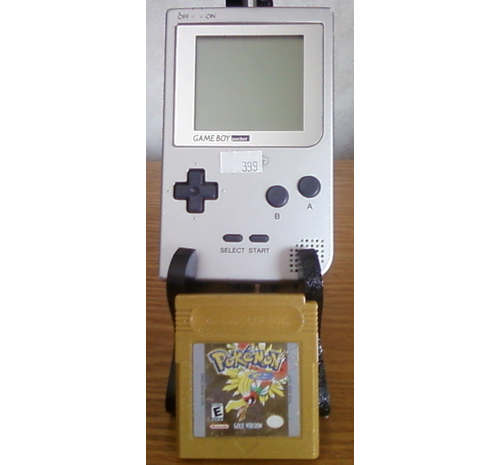 It was hidden amongst the bric-a-brac and at first I wasn’t sure the screen worked, until I adjusted the contrast (I almost forgot that was an option on the Gameboys). It had Pokemon Gold in the back and it was all one price. It was dirty and a little beat up, but it still functioned so I bought it! Pokemon Gold is notorious for not saving, mine doesn’t either. Number 7 goes with number 8, though they were found in different stores. Searching through bric-a-brac, again, I found a strange rubber device in the shape of a Gameboy. 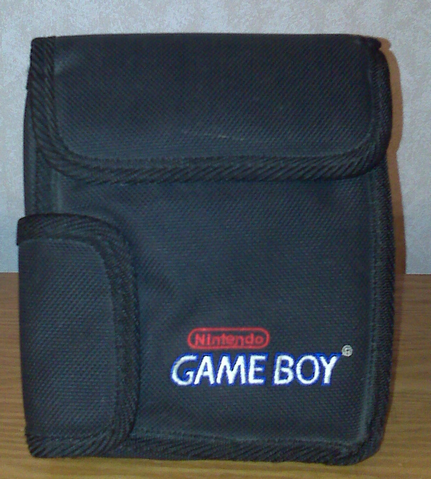 After picking it up and inspecting it some more, I found it’s a (Gameboy) Pocket Protector. 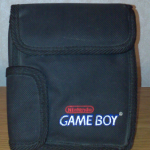 You slide your Gameboy Pocket into it and it protects it from bumps and scratching, I wish my Gameboy Pocket had this in the first place! 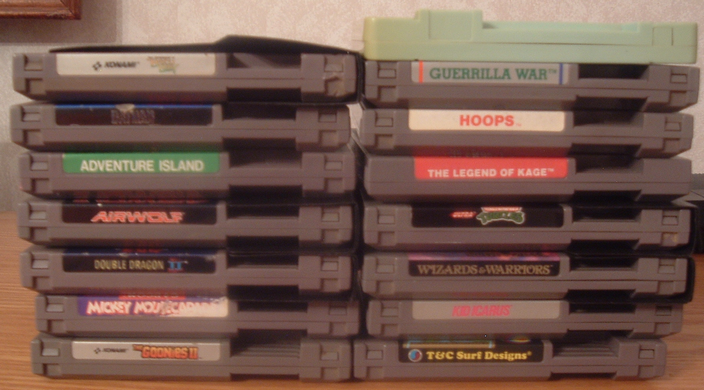 Recently one of my favorite thrift stores had a stack of NES games, so I bought them all! 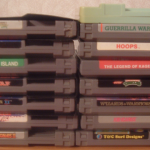 Some notable titles include: Guerrilla War, Kid Icarus, Adventure Island and Double Dragon II. Many of them were in poor shape and 2 of them had ripped labels, but they were all worth buying! A later trip to the store from the above score gave me 8 SNES games: Super Mario World + All-stars, Super Mario World 1 and 2, Pac-Man 2, Yoshi’s Safari, Frogger, Populous and Kirby’s Avalanche. This time the SNES games were all in good shape! 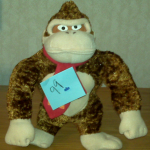 Number four isn’t a video game but a plush video game character! Thrift stores are a treasure trove of things people don’t want, you just never know what you’ll find! I often check toys and electronics in search of misplaced or miscategorized items. 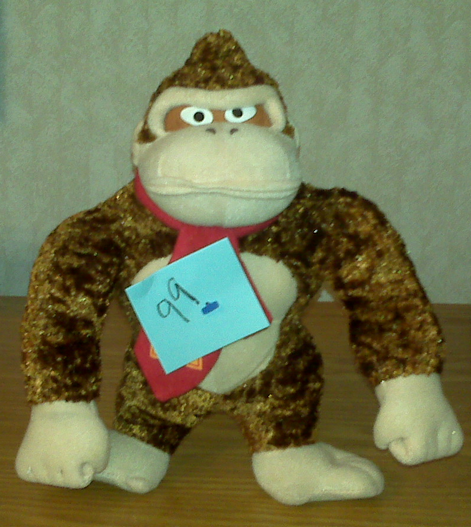 I happened to pass the stuffed animal bin and saw Donkey Kong gazing out at me…I had to have him! As I’ve said before, I am always looking for anything related to video games, especially carrying cases! Number 3 was hidden in with the purses at a local thrift store. 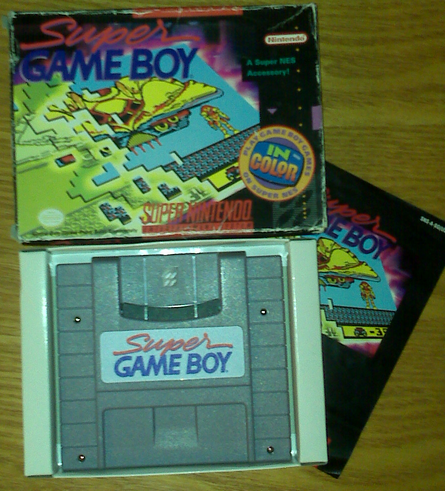 I was going through a bin filled with CDs right next to the purses when I saw GAMEBOY jumping out at me. I picked up the case, inspected it and bought it! On a whim I went a flea market I hadn’t checked in quite some time and came out pretty well! They had a lot more booths with vintage games than I remember, but all of them wanted too much. 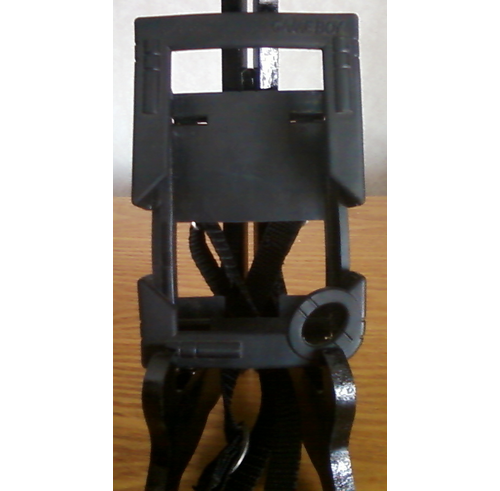 While looking through a small basket of cables and power supplies, I noticed the carved back of the infamous NES Dog Bone shaped controller. I used to have one as a kid and I have wanted to find myself a set more recently, but I’m not the only person wanting them and they can get pretty pricey. 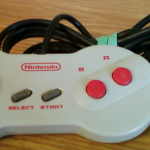 The start and select buttons are gnarled but they still work, sadly the SNES start/select pad looks close but won’t interchange. With the price I paid, I can’t complain. I found this one at a local used media store which I only purchase games from on rare occasions. The chain of stores are all individually owned and pricing seems to be the same throughout, but this particular store seems to be more fair and a little cheaper than the rest. 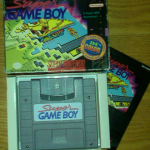 Within their glass case they had several Super Gameboy units, I inspected them all to find the one in the best condition. Although they were all the same price they were all in varying conditions, mine happened to be the only one complete in the box. 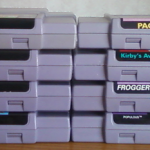 Woot on the Teenage Mutant Ninja Turtles, Populous, and the Super Game Boy!! I used to want one of those so bad!